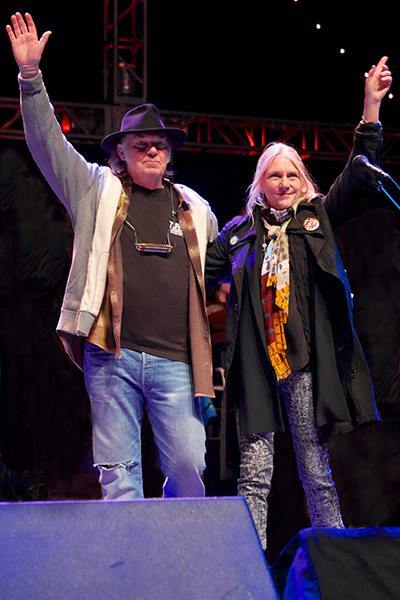 Neil Young has announced that he will no longer host his acoustic Bridge School Benefit Concerts after the thirtieth annual event was held last fall. Founded in 1986 by Pegi Young and Jim Forderer with help from Dr. Marilyn Buzolich, the Bridge School develops and uses advanced technologies to aid in the instruction of children with disabilities. The first benefit concert, in 1986, raised the money necessary to start the school, which opened in ’87 after the Youngs had difficulty finding a suitable school for their non-verbal sons, Ben and Zeke, who both have cerebral palsy. Neil and his ex-wife, Pegi – who split in 2014 after 36 years of marriage – each posted letters on The Bridge School website thanking everyone for their support of the fund-raising initiative. “Although I will continue in fund raising efforts, for personal reasons beginning this year I will no longer be hosting The Bridge School Concert,” explains Neil. “I wish everyone the best as the school heads into the future. My heart is with each and every child we have had the honor to serve and those we will continue to serve, and your parents, siblings, and extended families. You can read full statements by both Neil and Pegi Young at the Bridge School website, where you can also help with making a donation here. Past performers include Bruce Springsteen, Pearl Jam, Metallica, Guns N’ Roses, Tom Petty, Dave Matthews Band and the Foo Fighters, among many others. A 25th anniversary collection of performances was released in 2011. While the 2017 Benefit Concert has officially been cancelled, the event’s future moving forward remains unknown.